^ "Craft beer sales increase by 20 million litres". 3 News NZ. February 26, 2013. Archived from the original on April 14, 2013. 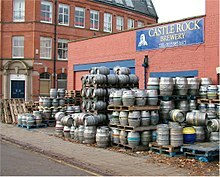 ^ "Brewery, Microbrewery, Brewpub. What's the Difference?". Evergreen. 2016-08-18. Retrieved 2019-04-25.